These aren't the first USB flash drives we've seen that double as detachable storage for Android devices - that honor goes to the Leef Bridge from way back in June. But darn it if Sony's new 2-in-1 flash drives aren't a whole lot slicker, combining MicroUSB and standard USB 2.0 plugs into a tiny package. From the single press image, it looks like the entire device is barely bigger than the two plugs put together. Sony's new flash drives will be available in 8GB, 16GB, and 32GB capacities starting in January. They'll command a premium over standard flash drives, of course: the 8GB version will retail for twenty bucks, the 16GB will be $30, and the 32GB version will be a whopping $62.99. Your Android phone or tablet will need to run 4.0 or higher and have USB On-The-Go capability to use the drive. If you've got all that, you should be able to get your file sharing on with full-sized desktops and laptops, or anything else with USB functionality, in no time. The drives will come with protective caps for both plugs in a choice of three colors (which Sony hasn't mentioned just yet). These should be popular with users who lament the lack of MicroSD options on many recent high-end phones, or those who just don't want to carry a USB cable around for file transfers. I only wish they came in USB 3.0 flavors. 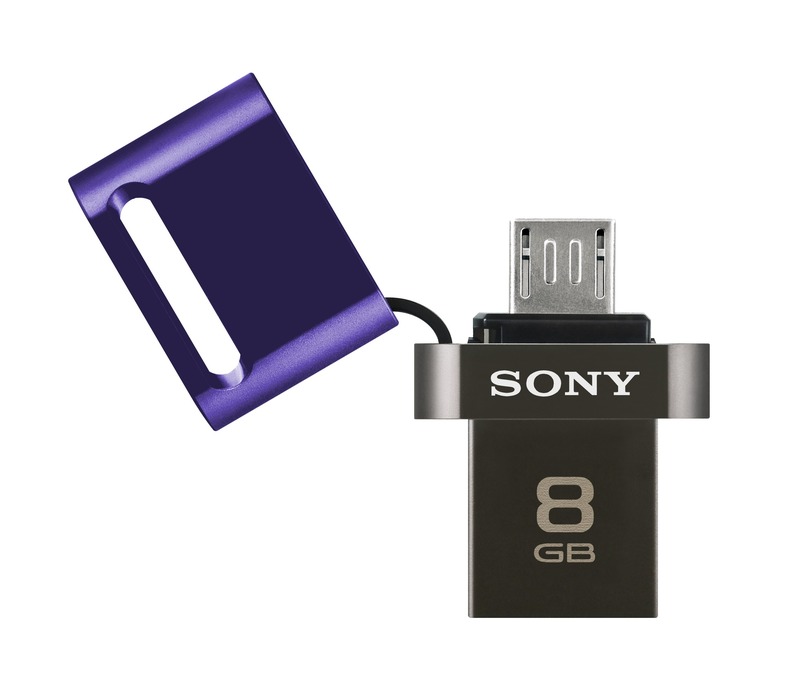 PARK RIDGE, N.J., Dec. 11, 2013 — Sony’s newest USB flash drive is a “2-in-1” device, with dual micro USB and USB 2.0 connectors for fast and easy back-up, sharing and storing of personal content. The new drive fits most Android* smartphones and tablets so mobile consumers can transfer and view photos and videos without using cables or Wi-Fi access. According to industry research, photo-taking is the third most common use for a smartphone, with viewing and sharing not far behind. Tablets are also finding similar use, increasing the need for multi-function devices. The compact devices are available in capacities of 8, 16 and 32 GB, and in a choice of 3 different cap colors. They join Sony’s existing line of storage and transfer options for home and mobile use, giving consumers more flexibility in how they manage personal data. The new drives are compatible with Android* devices, version 4.0.3 to 4.3** and offer the USB On-the-Go (OTG) function, which allows portable devices like smartphones to act as a “host” when connected to other USB peripherals. Consumers can also use the drives as additional or temporary storage for their smartphones and tablets, a storage option that’s ideal for enjoying large data files like feature-length movies or personal music libraries. A locking cap protects the connectors from damage, dust and debris, and the devices’ metal body is durable enough to withstand everyday mobile use. For easier operation from a smartphone, users can download the free File Manager app from the Play Store to help them easily search content stored on their different devices as well as copy, delete, playback and sort files. To learn more, visit: www.sony.net/Products/memorycard/en_us/usbsa/index.html. *Can be used with Android devices with USB flash drive connectivity using Android version 4.0.3-4.3, with planned future compatibility for Android version 4.4.